Early last spring, Mr. Aviles had approached me about presenting at ISTE 2015 during the summer. Seeing that the only thing I had planned for the summer was sleeping until noon, I said “Why not?” I visited the official ISTE Web site and scanned Google for information about the convention, yet I still did not know fully what to expect. Sure, I knew that it was a meeting ground for teachers to connect and share ideas, but I did not really understand what that meant. How big would it be? What would these teachers be asking me? Is anyone famous going? What am I even supposed to be doing? All these questions clouded my mind as our presentation day grew closer. 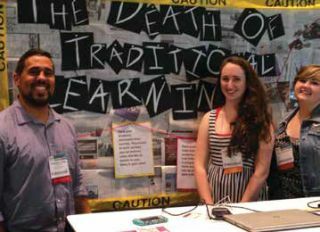 Our presentation was titled “The Death of Traditional Learning,” and we set it up as if it were a crime scene. Our whole scheme was to show the death of traditional learning and the birth of Passion-Based Learning. We wanted to show teachers that students can do amazing things if they are allowed to apply what they love to their education. Passion-Based Learning is about giving students control of their education and letting them succeed in their own way. During the presentation, we talked about our technology-based English class, the Be About It Projects that we completed sophomore year, and the crowd-funding campaign experience we had as we tried to redesign our classroom. The best thing about ISTE was definitely how interested other teachers were in what we were doing. While Mr. Aviles would tell us that people would tweet him about all the cool things we did, it never really set in how progressive we really were. Seeing real-life people who wanted to emulate what we created was beyond awesome. It proved that we were making a loud change in the education world. I was asked how others can recreate our Be About It Projects and how to become more of a 21st-century teacher. Though I don’t really know if teachers are going to take the advice we gave them, it’s satisfying to know that someone might get a better educational experience because of what we preached.